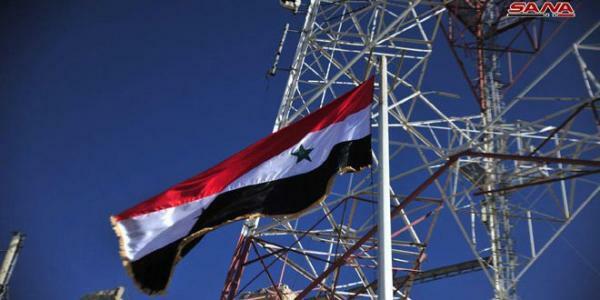 Units of Syrian Arab Army entered Daraa al-Balad area and hoisted the national flag over the main square ahead of declaring the city free of terrorism. SANA’s reporter in Daraa said that army units entered Daraa al-Balad area, heralding the return of security and safety to it under the agreement reached on Wednesday. According to the agreement, terrorist groups will hand over heavy and medium weapons in addition to having the legal status of militants-who are willing to- settled, while those who refuse reconciliation will be evacuated. The agreement includes the areas of Daraa al-Balad, the Dam Road, the Camp, Sajna, al-Manshyia, Gharaz and the Silos. The reporter added that the army’s engineering units will sweep the residential neighborhoods in the liberated area in preparation for the entry of the workshops to rehabilitate infrastructure and restore basic services to Daraa al-Balad area. With the Syrian Army entering the area of Daraa al-Balad, another chapter of terrorists’ crimes comes to an end. For over seven years, the safe neighborhoods in Daraa city had been bombarded with thousands of shells, claiming the lives of many innocent citizens and injuring many others.